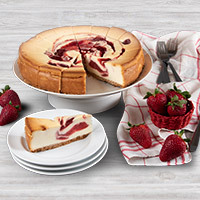 One of our most unique cheesecake gifts, this gourmet Crème Brulee Cheesecake is a delicacy! Richly flavored with vanilla beans, caramelized sugar, and fresh cream, this will become a fast favorite for even the most seasoned cheesecake aficionado. 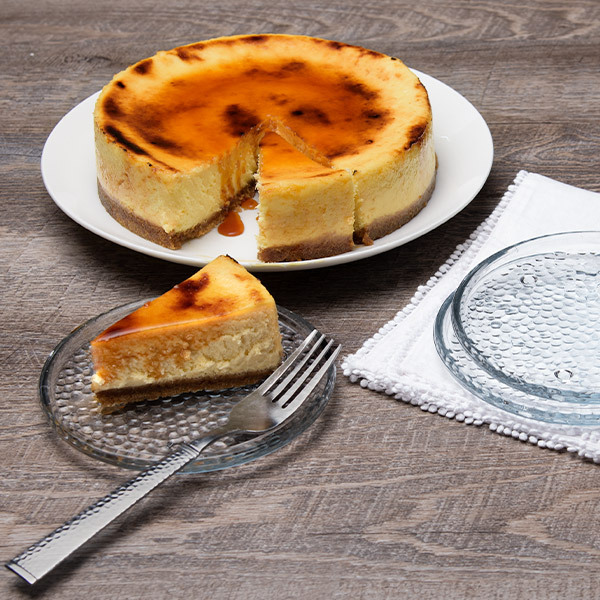 Our 9", 60 ounce Crème Brulee Cheesecake is guaranteed to impress so send one today! This was by far the best cheesecake I ever had. My guests raved about it as well. Worth the price for sure! It arrived a day earlier than the date I had requested, but that actually worked out fine. It was very great, smooth, and delicious!!! It tasted extremely fresh and it was better than I had anticipated!!! My kids sent me the Creme Brulee Cheesecake for Mothers Day. I have always loved Creme Brulee and Cheesecake - but put them together and OOOOOOOOOHHHH! The most wonderful, mouth-watering flavor to ever bless my taste-buds. Purchased for my co-worker's birthday, in her words "best Creme Brulee cheesecake " she had ever tasted. I definitely agree, and so did the remaining staff. Will order again. Thank you. I ordered the Creme Brulee Cheesecake for Valentine's Day 2018 for my husband, who is a lover of both creme brulee and cheesecake desserts. This cheesecake was an excellent marriage of both creme brulee and cheesecake combining a dense, yummy cheesecake filling, creme brulee flavoring, and a tasty, but not too sweet graham cracker crust. The cheesecake arrived on time and was well packed in dry ice and the appearance was as beautiful as the advertisement. 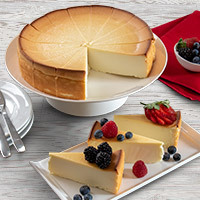 I will definitely order again and would love to try other flavors, but we found perfection in the Creme Brulee cheesecake, so it may be hard to deviate to another flavor. I bought this for my daughter-in-law birthday and got excellent reviews. Next time will order for myself . I buy the creme brulee at least once a month, after I tried it I was hooked, before I was buying a vanilla bean cheesecake from a different manufacturer, not anymore! You have got to try it! You cannot go wrong with this flavor. Absolutely incredible. Perfect blend of Creme Brulee and Cheescake. I have been searching the web for local stores since I tasted this and it appears I will need to order online. : ( Extraordinary Dessert !! Bought this for my wife and mother to have fordessert after a nice nice meal out. We all loved it. This Creme Brûlée cheesecake was silky smooth and flavorful. The crust added texture and sweetness and complimented nicely. I am delight I had this sent to my son's Christmas meal- It was a hit.